As you know, Belysio‘s developers do their utmost to keep the app’s data load as low as possible. Nevertheless, we advise all our users to track their data consumption diligently, and to opt in to any good data plan offered by their operator. Mind you, Aatski is among our Top 25 Heavy Users list! 3 embedded geo journalists will report on a 3 country, 30 team car rally that is stress-testing the latest navigation technologies on 7 October – live, from their mobile phone. Belysio and the Navigation Event in Eindhoven will then co-producte the world’s first photo-microblogged car rally, to field test and benchmark the latest navigation technologies from companies like Garmin, TomTom, Mio and others. The rally will follow a ten hour route through Holland, Belgium and Germany. “In previous years our seminar attendees, exhibition visitors and members of the press, missed all the fun,“ sayd Pieter Hermans of the Navigation Event. “This year they will be able to follow the rally and funny moments from the exhibition hall with a regular feed of Belysio photo tweets and commentary, as they appear on a large map projected onto the exhibition hall wall.” Anyone can follow these reports live on the web at the Navigation Event and Belysio websites. Belysio’s Geo Journal provides a simple interface that allows you to capture a photo and select to which audience you wish to publish it. Before uploading you have the option to annotate it and then publish. It enhances micro-blogging and other forms of lifestreaming by enabling users to automatically location stamp and comment on their photographed experiences , and to instantly publish these. This gives an added dimension of relevancy and authenticity to postings. Geo-tagged photos that are publicly published also enable others to search locations and see the experiences people have shared around a specific location. The all new Belysio Geo Journal map interface (hybrid mode). In the previous rallies in 2005, 2006 and 2007 the participating rally teams had to accomplish several different tasks during each lap. Concurrently the teams had to validate each navigation system they tested. On this day the competing rally team will drive several laps, to point out the best navigation system and also to win the “Best Navigation Team 2008” Trophy. The rally will feature Intense usage of several types of navigation equipment (multimodal): personal navigation devices, mobile phones with GPS (for on and off-board, and in-dash systems). The rally is part of the European Navigation Event, fourth edition, to be held at the High Tech Campus in Eindhoven, The Netherlands, on 7 and 8 October. For more information about the event, contact p.hermans[at] jakajima [dot] eu. I’m a promiscuous digital networker. I’m participating, more or less actively, in about 10 social networks (and doing research for my Everything 2.0 index, I’ve registered to hundreds more). Everywhere I’ve submitted my real name, my real contact data, and (wherever I took the trouble) a real photo. And now that I use Belysio, 24/7, I’m also abundantly sharing my whereabouts. Am I in danger now? Will people break in at my office when they see that I’m abroad, or will a burglar do some fun shopping in my living room when he sees I’m in a business meeting in the next city? Do the approximately thousands of people that I’ve shared my data with on Xing, LinkedIn, Facebook or Belysio spam me with unwanted messages? Will phishers steal my credit card data? Will people steal my identity? I don’t think so. I think being totally transparent, and being as generous in sharing data as I can, will be rewarded by people giving me back the same, or even more of it. (In the 4 years that I’ve been part of Xing and LinkedIn I’ve never traced even one spam message from somebody with whom I shared my emaill address!). Do I think that everybody should behave as abundantly “open” as I do? Definitely not. Kids shouldn’t, full stop. Women should always be more careful than men. If your boss tracks you through any location service, he’d better have a very good business reason for it, that you can endorse. Everybody should be able to tweak their privacy settings to the exact level they feel comfortable with, under all feasible circumstances. That facility to tweak your privacy settings is one of the things that Belysio is excellent in. They’ve defined privacy protection as one of their core competencies. But what’s more, every time I log in, they take care of making me aware of the fact that I’m sharing something sensitive if I share my location, by asking me to opt in to either sharing it with no one, my family, my friends, my other contacts, or strangers. Furthermore, they’re offering me a whole set of features to calibrate my “openness”, up to extremely granular, social and circumstancial levels. There may, however, be some privacy matters that Belysio has overseen. Do you see any room for improvements? The Harris Report 2007 (PDF). David H. Williams, LBS Development – Determining Privacy Requirements. C. Enrique Ortiz, Privacy Notes: Geofencing and Guidelines for LBS Developers. Sam Altman (Loopt), Best Practices for Location-based Services: Privacy, User Control, Carrier Relations, Advertising & More. Privacy concerns a major roadblock for LBS adoption. Belysio is making a big splash this week. In our home country Poland we’re the talk of the day after some great newspaper articles, tv and radio broadcasts. This morning we were featured in a breakfast show on national television. A few throusand people registered afterwards (sorry to all people that suffered from a slower website as a consequence). The site integrates the best of social networking with modern cellular technology to make it possible for you to have an all inclusive experience. […] It takes social networking to whole new levels. […] An avant-garde social mapping service that changes the way people use mobile phones to stay in touch with their friends. Belysio de-virtualizes social networking between friends and allows life encounter of people in the real world. It gives your mobile phone a smart address book, multi-messaging, e-mail and the location awareness all combined. […] A simple concept but […] powerful social networking experiences […]. Man hat also nicht 10 oder mehr Clients downzuloaden und muss alle einzeln Bedienen respektive Nutzen. Belysio kombiniert das ganze zu einem. […] Habe den Client downgeloadet. 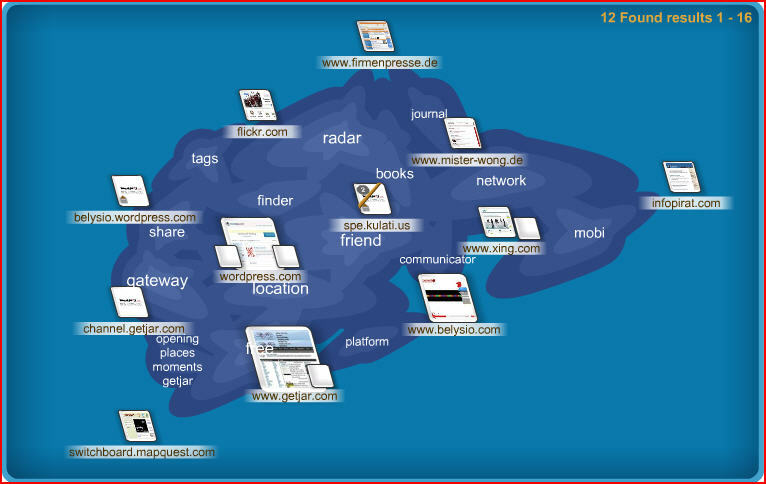 Einfache Installation – hat alles reibungslos funktioniert. […] Die Applikation für das Handy [kommt] mit einer äußert schicken und leicht zu bedienenden Oberfläche daher. […] Die Standortanalyse über meinen Provider war überraschend genau. […] Belysios Ansatz einer mobilen, integrierten Kommunikationszentrale mit Statusupdates und ortsabhängiger Komponente ist gut. Die mobile Applikation macht einen vielversprechenden und stabilen Eindruck und bietet angesichts geringer Trafficansprüche auch für Benutzer ohne Datenflatrate zahlreiche Anwendungsszenarien. And, if you read German, don’t miss the excellent interview that Mobile Zeitgeist‘s Heike Scholz had with Belysio co-founder Andreas Bauer! ABI Research (SEP 2008): More than 140 million mobile (paying!) 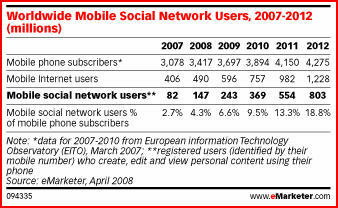 subscribers will use social networks on their phones by 2013, generating over $410 million in subscription revenues. This forecast is lower than its previous estimates. In December 2006, they forecasted 174 million users by 2011. 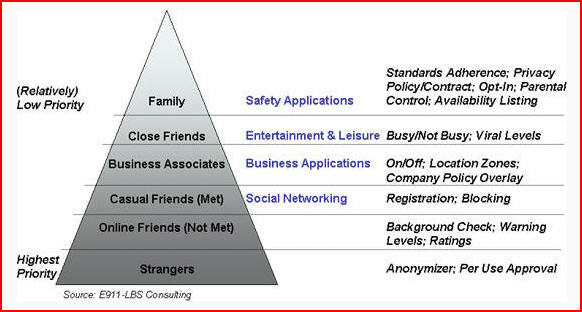 Pyramid Research (FEB 2008): There will be 950 million (paying and non-paying) mobile social networking users by 2012. Juniper Research (AUG 2007): The number of (paying and non-paying) mobile social networking users will rise to 600 million by 2012. I think these numbers are entirely realistic. I am already using Belysio to access my networks on Facebook, LinkedIn, Xing and MySpace – and I’ll certainly use it to browse my other networks as soon as Belysio will facilitate that. Accessing my communities over my cell phone simply bridges the gap between sitting behind my laptop to “administrate” my contacts, and meeting or communicating with them in real life. Marketing research company Synovate last Monday released the results of an international survey. In their press release they share one interesting chart, showing the Top 3 communities in 17 markets. Across the 17 markets surveyed, 42% of people know what online social networking is. The Dutch were most likely to know the term with 89% answering ‘yes’, followed by Japan at 71% and Americans with 70%. 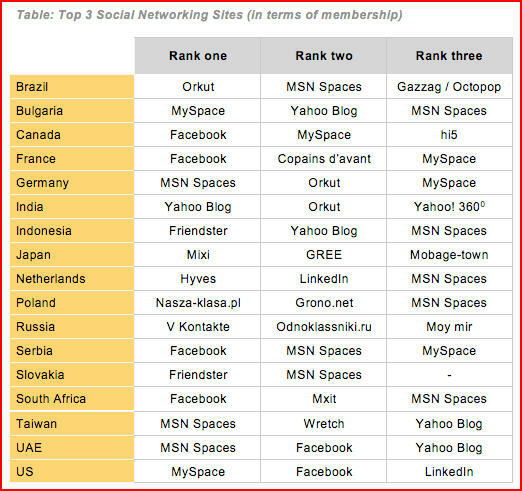 Overall, 26% across the markets surveyed are members of social networking sites. This peaked with the Netherlands at 49%, United Arab Emirates (UAE) at 46%, Canada at 44% and the US at 40%. Biggest concerns were lack of privacy (37%) closely followed by lack of security for children (32%). The Dutch were the most concerned about privacy at 54% and lack of security for children was the biggest worry for Americans with 62% of respondents nominating it. 85% of Japanese and German social networkers were uncomfortable handing out details, followed by 83% in Taiwan, 79% in Canada, 77% in Brazil and South Africa and 70% in Poland and the US. Overall, 53% of social networkers notice site sponsors. Two thirds of site members notice advertisements for products. Thirty-one percent of social networkers notice interactive profile pages featuring brands. Forty percent of people who engage in social networking agree that online communication can be just as meaningful as face-to-face communications. Almost half (46%) agree that it is easier to make friends online than in person. Thirty seven percent of all people from the UAE, 35% of South Africans and 29% of Taiwanese agreed that they had more friends online than they have in the ‘real’ world.